By John H. Kramer, Ph.D.
Modern mapping technologies enable geologists to create and visualize maps in a digital format while on the outcrop. Such "born digital" maps (Fitzgibbon, 1997) provide new opportunities and pose new challenges to state geological surveys and the USGS. A new generation of geologists trained in digital technologies is emerging from University programs, notably the Earth Resources Center Digital Mapping Lab at UC Berkeley. These digitally literate field geologists can create field products that port directly into publishable format, or to the Internet for wide distribution. Digital mapping technologies are changing the way geologists create maps in the field. Field computers now link field geologists to digital versions of pre-existing maps and ortho-photographs, while providing full edit, line-creation and area-fill capabilities. Laser range-finding devices and Global Position System (GPS) receivers provide field geologists with accurate tools for locating geologic features in the field. Mobile analytical instruments, such as soil gas analyzers, magnetometers and IR spectrometers expand the scope of field mapping tasks and provide field mappers immediate feedback to refine sample locations and prospect for meaningful data points. Geologists with digital cameras can attach photo files to symbols on digital maps while in the field. In this paper, I summarize the technologies currently being deployed for creating and editing geologic maps in the field. Modern hardware and software are described along with the apparent trends in their development. Some examples of their application to geologic mapping are given. Also described is a field-to-Internet link in which camera locations and resulting digital photo panoramas are displayed on a web site where they are used to calibrate and validate computer-renderings of potential future landscapes. This process provides direct field feedback to an open-access technology for disseminating information to the public, which is consistent with the mission of government information agencies such as the state geological surveys and USGS. Hardware for digitally based geologic mapping generally includes a computer and compatible input devices. Computers that operate in a Microsoft Windows environment include ubiquitous laptop computers, pint-sized variants like the Panasonic CF-M33, a number of tablet pen-computers (dominated right now by Fujitsu), and lesser-known but highly field-portable wearable computers (e.g. Via). A step down in capability and cost, but of lighter weight and smaller size for field applications are the palm-sized computers. These operate either in Windows CE (and its next-generation Pocket PC operating system), or the less battery-dependent Personal Data Assistants (PDA) operating in Palm OS. The hand held computer market is rapidly developing, with new models appearing about every 90 days. Figure 1. 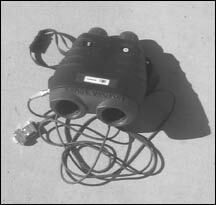 Laser binoculars with compass, inclinometer, and data output cable. Accessory hardware includes an array of laser range-finding devices and survey instruments, digital cameras, many GPS input systems (several manufacturers provide autonomous and differentially corrected systems), and direct-sensor input from analytical equipment. In addition to survey total stations, more ruggedized equipment is available, such as the laser binoculars shown in figure 1. These are equipped with an internal digital compass, inclinometer, and reflectorless laser range finder. Data is accurate to within 1 degree and 1 m (up to 4 km) and exports data via RS232 serial interface to field computers. Laser recycle rate is about a point every five seconds, which allows for rapid mapping of distant points or moving targets, for example, a migrating oil slick. Figure 2. Sunlight-readable color displays became available for the first time in 1999. The latest and greatest advancement in field hardware is the sunlight-readable color displays that hit the market in 1999. For the first time geologists can see displayed field maps in the sunlight without shading the screen and squinting. These displays are built into pen computers, palm-sized computers, or are tethered to belt-worn or backpacked laptops as shown on figure 2. Until these screens were available, geologists could only work in sunlight using gray scales on transflexive monochrome displays. The mapper shown in figure 2 also has a backpack containing a differentially corrected GPS receiver that provides precision at the sub-centimeter level. Hardware is constantly improving, but only in the past two years have the computers, screen technology, battery life, GPS and other peripheral devices become enabling tools for geologists to efficiently create digital maps in the field. Numerous software solutions for digital field data collection have been developed for different operating systems and hardware platforms. In this section several will be described, from the simplest to the most complex. The major GPS manufacturers: Leica, Garmen, Trimble, and Magellan to name four have produced various navigation aids and data loggers for their receivers. These software programs are generally written in proprietary operating systems for display of position and coordinates while in the field, and typically do not support direct input and output of maps. GPS-specific digital mapping aids are constantly being upgraded and both Leica (GS50) and Trimble (GeoExplorer3) have capability for GIS database update. The USGS has used the note-recording software on hand held computers for collecting field notes in digital format (Williams, 1999; Walsh et al., 1999a; Walsh et al., 1999b). In these applications, field notes in electronic format were used to replace paper notebooks. These systems linked ASCII field data to position or time using GPS waypoints. Line data was digitized from a paper map and used in conjunction with GSMCAD (Williams et al., 1996), a Microsoft Windows program developed at the USGS for compilation of geologic maps, or with other map production software. Autodesk, the largest distributor of CAD software, has recently released OnSite, a mobile computing application on the Palm OS platform that supports positional data in a map format. The Geological Survey of Canada developed the first well-implemented conversion from paper-based methods to digital field data collection using the Fieldlog software. Field data was collected in a digital notebook (Apple Newton) and linked to an AutoCAD/rdbms-based geologic GIS system as described elsewhere (Brodaric, 1997). The data-collecting software supports a relational geological database and ASCII files are transported into the more complex GIS mapping system at base camp. Another field-data entry software that interfaces very closely with the GSC system is Fieldworker. This commercially available product also developed for the Newton (now discontinued) has been converted to the Windows CE OS (http://www.fieldworker.com/). The system has been embellished to include an interface with GPS receivers and laser devices. A competing CE-based mapping software developed for survey and mapping work that also interfaces directly with GPS receivers and laser devices is Solo CE by Tripod Data Systems. In addition, ESRI, developer of the popular ArcView GIS software, has launched a CE-based map/photo-reading, navigation and data collection product called ArcPad that uses the graphical user interface familiar to ArcView users. ArcPad employs the popular shapefile format and is compatible with the latest image-compression technology (Mr. Sid). It also comes with the backing of the largest GIS software supplier in the world. All CE-based software will eventually have to convert to the Pocket PC operating system, Microsoft's next generation OS for palm devices. The reason for the name change has marketing pundits questioning the success of the CE-style OS for PDAs. Has Microsoft tried unsuccessfully to shoehorn too many PC capabilities into too small of a box, thus failing to compete with the scaled back PDA systems that very efficiently deal with limited, specific functions? Will Pocket PC be an upscale version of CE with a new name, or will it represent a retreat to the leaner type OS proven in the PDA market? From a geologic mapping standpoint the concept of a CE-style OS is superior because it supports faster processing, higher screen resolution with color display, larger input files and more complicated programming for map scroll and user interface. A disadvantage is shorter battery life than the streamlined Palm OS PDAs. Performance of CE-based software also limits functionality because screen redraws of complicated maps are very slow by desk-top PC standards. Field workers are not especially known for their patience, and CE-software cannot match the computing speed or power of a true Windows-based field mapping software. The range of applications of GeoMapper/PenMap is broad and includes general geology, geomorphology, petrology, structural geology, mining geology, exploration, pedology, and environmental geology. In practical terms, GeoMapper is a computerized mapping legend which contains both the geological features needed to map the earth as well as a visual interface to use all the digital electronic equipment a user selects. The mapping tools include a pen stylus which serves the purpose of a full set of colored pencils. In combination with digital topographic maps or color ortho-photos on the screen of a portable computer for positioning, this is all that many users may require to undertake digital mapping. Additional digital tools include sub-meter accuracy GPS, laser range finders, digital cameras and visible/infrared (IR) spectrometers. Lithology symbols are included so that both black and white patterns can represent rocks and color can be used to show formations, structures (faults and veins), alteration and mineralization. GeoMapper is constructed from the standpoint of the end user who wishes to do geological mapping, sampling and surveying as soon as possible. It eliminates the complicated multiple steps of transferring paper maps to digital output by scanning and interpretation which can lose or corrupt information. Interpretation with GeoMapper is done in the field where models can be checked against nature. The organization of the visual interface is designed around the requirements of mapping practice and the structure of the files created is consistent with extraction of information to solve real problems. Most useful for geologists are the automated buttons in GeoMapper that set methods, layers, and line type for different customized geological mapping functions. To preserve screen space, additional buttons for lithology, formation, structure, mineralization and alteration cascade out of the legend if needed, as shown in figure 3. The 2000 Geological Society of America Annual meeting in Reno will include Topic Poster Session #70 on High Technology Tools for Geological Research and Practice, where Geomapper output will be on display. A complete presentation of the geological mapping system developed at UCB will occur at the Symposium on Geological Mapping at the Berkeley Earth Resources Center Digital Mapping Lab starting Friday November 17, 2000, immediately following the Reno GSA Annual Meeting. For details on the symposium, contact brimhall@socrates.berkeley.edu. The underlying PenMap software is designed for data collection and interpretation of data in the field. The software retains metadata on the methods that were used to collect the 3-D position coordinates for all nodes used to create graphics, locate symbols, points, lines and polygons on the map. Useful features provided by the software include user-design of GIS databases, digital terrain modeling of up to five surfaces simultaneously (elevation and four GIS attributes), 16,000 drawing layers for GIS data control, CAD interface and convenient map display. 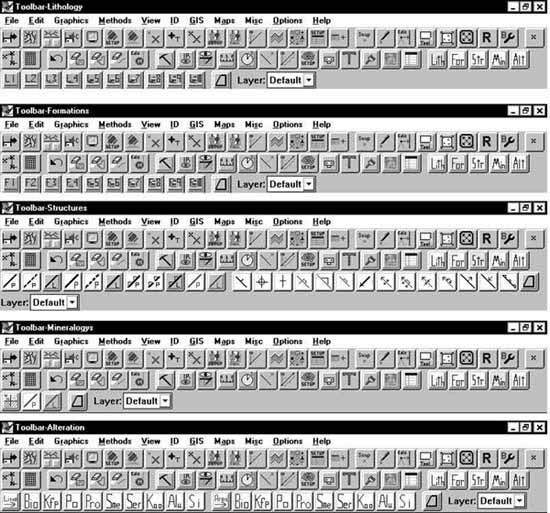 PenMap imports and exports to a number of different file formats, including DXF and ArcView shape files. Many other features are described elsewhere (Kramer, 1997, 1998). Field mapping systems integration is the process of defining the project needs and constraints, specifying the tools and training required for success, and monitoring progress. Systems integrators must select from a plethora of options along a continuum of complexity from the simple collection of numeric data, to the most advanced mobile computing options involving wireless communication and digital or video imaging. Add to this the hyper-evolution in the hardware market with frequent software rollovers, and one realizes that successful systems integration is like hitting a moving target. In each instance, a unique set of criteria and requirements guides the choice of tools and the type of training needed for field mapping systems integration. Successful integrators must be visionaries who believe the efforts to implement a digital field mapping capability are outweighed by the potential efficiency gains. Successful systems integration specialists are those who require clear project definition, full commitment, thorough training, rapid deployment, and high utilization of equipment (before it becomes outdated). By achieving rapid results, the concept of digital mapping is proven. Then, upgrades become a desirable enhancement to a successful program. System integration specialists assemble field systems of components from different manufacturers (computer, software, GPS, laser, bar code reader, etc). Examples of integrated high-end systems for PC-based mapping are Vectormap (laser capable) or the Digital Reconnaissance Set (laser and GPS capable), both of which cost approximately US$10,000 or more. Typically, because of limited volume, high end systems are customized individually for the intended application. Recently, as prices have come down, pre-assembled lower-end kits have become available. The Full Monty Package, consisting of a Compaq palm-sized computer running ArcPad linked to differential GPS (sub-meter accuracy), is selling for under US$3,000, which is less than the price of many differential GPS systems alone. Without the differential GPS, a user can begin digital field mapping on a CE platform for under $1,000 per unit. Brimhall (1998) noted the rising number of non-geology students who enroll in geologic field mapping courses in order to get training in field mapping techniques. These include biologists, engineers, environmental scientists, public policy majors and others who look to geologists for training. 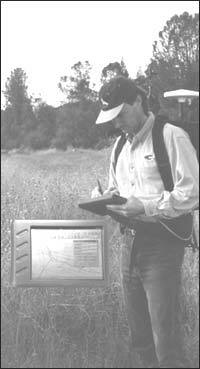 This diversity of interest in field data collection is also reflected in the history of commercial deployment of digital field mapping techniques. In addition to geologists, others who have employed digital mapping technology include pipeline constructors, archeologists, foresters, farmers, infrastructure inventory providers, surveyors, planners, police and the military. The wide use of GIS for planning and infrastructure management creates the need and even the expectation for combining geologic data with other spatial information. As more and more digitally-literate field workers from all disciplines emerge from Colleges and Universities each year, we can expect to see the map-making capabilities of our state geological surveys and the USGS used by a wider spectrum of specialists, in new and unforeseen ways. An example of one such unforeseen use is a project recently completed in which digital field mapping and photography supported computerized landscape renderings accessed via the Internet as described below. Using the World Construction set software, Condor created computer-generated landscapes from a digital elevation model (DEM). These were used to visualize modeled landscape changes associated with the build-out of a waste-rock dump at a mine. (We have also done renderings to visualize a future gravel quarry.) Such modeled visualizations can be more precise than artists' renderings and are useful for policy makers and the public unfamiliar with contour maps. Just as in other types of computer modeling, a calibration or validation process enhances confidence in the computer output. Figure 4. Digital photograph looking north from location shown in figure 5. Figure 5. Digital field map of photo location shown in figure 4 and other features used to calibrate computer-rendered landscape. Figure 6. 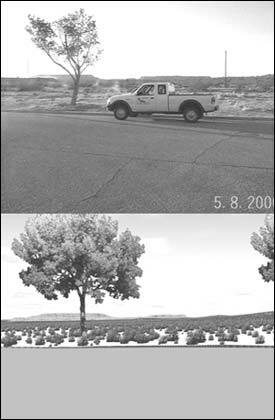 An example of the use of digital photography to validate a computer-modeled landscape. For calibrating the rendering, a digital photograph mosaic of the desired view was collected. An example of one photo from a calibration mosaic is included as figure 4. A map of the photo site was made using PenMap and differential GPS, with sub-meter accuracy, as shown in figure 5. 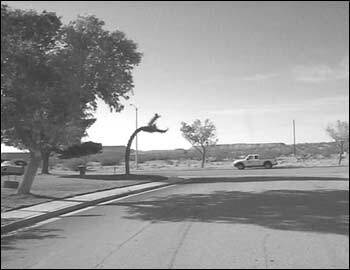 The camera view point ("photo") and prominent features that appear in the photo ("cottonwood tree", "joshua tree", "lightpole", etc.) were mapped and imported into the DEM used to create the renderings. Thus, the precise camera position was used to generate the rendering, and digital images of trees were imported at the locations of the real trees mapped in the field. The rendered landscape was compared to the photo-mosaic to validate the computer model in the minds of the viewer. An example calibration suite of a photo and rendering is shown in figure 6. Once calibrated, the same DEM was amended to include the components of the hypothetical future waste-rock dump. Two new renderings from the same camera view were made of the amended DEM to create a realistic view of things to come, first without and then with a buffer of trees. A truck from the photo was superimposed to show the scale of the trees in the final version of the rendering. The renderings of the future landscapes are not available for publication, but the process can be seen in the present-day landscape shown in figure 6. The final products were posters showing a map of the area with the camera view displayed, a photo-mosaic of the true scene, the associated rendered landscape, and two renderings of the future view, with and without trees. The posters were used at a public meeting but could also have been available to the public via the Internet. In the process of developing the desired views, Condor mounted the illustrations on a secure Web site where the client could view and comment on drafts. In this way, digital field methods were fully integrated into an Internet access port. Mapping agencies will someday be expected to support Internet based interaction between field work and public in this or similar ways. Digital field mapping has come of age. Tools for digital mapping and field data collection are available for a wide range of mapping tasks, from the collection of numeric data and notes to full geological mapping capability. Various supporting technologies (GPS, laser, digital photo, analytical sensors) supplement and expand the capabilities of field geologists. Integration of digital mapping systems into an organization's mission is a challenging task during the fast-paced evolution of hardware and software. While integrators most often tout enhanced efficiency in the field, (quicker, more accurate, fewer mobilizations, etc. ), there are pitfalls to this argument that can sink a budding program. Logistically, digital mapping is a more complex operation than pencil and paper methods. There are dozens of details that must work in consort (batteries, cables, back-up procedures, etc.) that require training and continued practice. The real efficiency-gain from digital geological field mapping comes from the compatibility of digital field maps and final output formats (Kramer 1998). As digitally trained professionals are only just being trained, the eventual rewards of born digital maps are still unforeseen. Digital mapping and associated technologies will make new uses for geologic information, changing the ways that state geological surveys and the USGS interact with the public. Brimhall, George, 1998, Direct Digital Field Mapping Using Pen-Based PC Computers Supported by Differential Global Positioning Systems and Laser Range Finders: Geological Society of America Annual Meeting, Abstracts with Program, v.30(7), p. A-256, http://www.geosociety.org/cgi-bin/annual-meeting-abstracts-query.pl. Brimhall, George, 1999, Evaluation of Digital Mapping in Introductory and Advanced Field Classes at UC Berkeley: Geological Society of America Annual Meeting, Abstracts with Program, v.31(7), p. A-191 http://www.geosociety.org/cgi-bin/annual-meeting-abstracts-query.pl. Brimhall, George, Vanegas, Abel, and Brown, Jeremy, 1999, Digital Geological Mapping System - a Visual User Interface Configuration for PenMap Users - Using Pen PC Computers, Differential Mode GPS, Laser Range Finders, Digital Cameras: Earth Resources Center Digital Mapping Lab, University of California, Berkeley, CA 94720-7450, brimhall@socrates.berkeley.edu. Brodaric, Boyan, 1997, Field Data Capture and Manipulation Using GSC Filed log v.3.0, in D.R. Soller, ed., Proceedings of a Workshop on Digital Mapping Techniques: Methods for Geologic Map Data Capture, Management, and Publication: U.S. Geological Survey, Open-file Report 97-269, p. 77-81, https://pubs.usgs.gov/openfile/of97-269/brodaric.html. Fitzgibbon, Todd, 1997, Buck Rogers, Field Geologist: 21st Century Electronic Wizardry for Mapping and Field Data Collection: Geological Society of America Continuing Education Course, Annual Meeting, Salt Lake City, UT, Personal Communication. Kramer, John H.,1997, Future: Geologic Mapping as a Digital Art: Geological Society of America Annual Meeting, Abstracts with Program, v.29(6), p. A-472, http://www.geosociety.org/cgi-bin/annual-meeting-abstracts-query.pl. Kramer, John H., 1998, Advances in Digital Field Mapping: Geological Society of America Annual Meeting, Abstracts with Programs v.30(7), p. A-256, http://www.geosociety.org/cgi-bin/annual-meeting-abstracts-query.pl. Williams, V.S., Selner, G.I., Taylor, R.B., 1996, GSMCAD, A New Computer Program That Combines the Functions of the GSMAP and GSMEDIT Programs and is Compatible with Microsoft Windows and ARC/INFO; U.S. Geological Survey Open-file Report 06-007, http://ncgmp.cr.usgs.gov/ncgmp/gsmcad/. Williams, V.S., 1999, Simple Techniques Used at the USGS for Compiling Digital Geologic Maps in the Field: Geological Society of America Annual Meeting Abstracts with Program, v.31(7), p. A-191, http://www.geosociety.org/cgi-bin/annual-meeting-abstracts-query.pl. Walsh, G.J., Reddy, J.E., Armstrong, T.R., Burton, W.C., 1999a, Geologic mapping with a GPS Receiver and a Personal Digital Assistant Computer Streamlines Production of Geologic Maps: Geological Society of America Annual Meeting Abstracts with Program, v.31(7), p. A-192, http://www.geosociety.org/cgi-bin/annual-meeting-abstracts-query.pl. Walsh, G.J., Reddy, J.E., and Armstrong, T.R., 1999b, Geologic Mapping and Collection of Geologic Structure Data with a GPS Receiver and a Personal Digital Assistance PPA Computer, in D.R. Soller, ed., Digital Mapping Techniques '99 -- Workshop Proceedings: U.S. Geological Survey Open-file Report 99-386, p. 127-131, https://pubs.usgs.gov/openfile/of99-386/walsh.html.